The Ko Ko Mo is three ounces cream, one ounce creme of coconut, one ounce amaretto, one ounce creme de cacao and one ounce vodka, blended with a scoop of crushed ice for three seconds and served in a clear glass with a plastic swizzle stick. The foamy white cocktail leads off a menu of more than 100 drinks at the Hala Kahiki. Jim Oppedisano, whose grandparents opened the tiki bar in 1966, has tried them all. The Hala Kahiki, located about six miles south of Chicago’s O’Hare International Airport in the suburb of River Grove, has caused more than one passing driver to do a double take, wondering how a weathered beach shack arrived on such a bland stretch of Midwestern road. 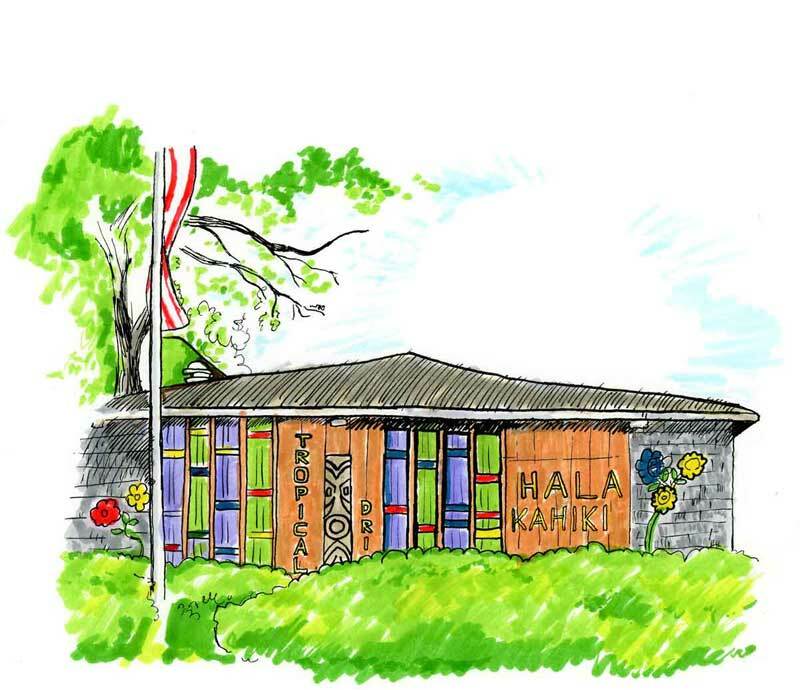 In fact, much about the Hala Kahiki’s origins is serendipitous. The tiki theme was inspired by bamboo fencing that Oppedisano’s grandparents used to cover their shabby walls, and the name came from a comic strip. When the bar opened in 1966, the tiki fad that had swept American pop culture over the previous three decades had already peaked. Yet nearly 50 years later, the Hala Kahiki is one of the last true tiki bars left in the region. Stanley Sacharski, who co-founded the Hala Kahiki with his wife Rose, built the front bar and canopy himself. 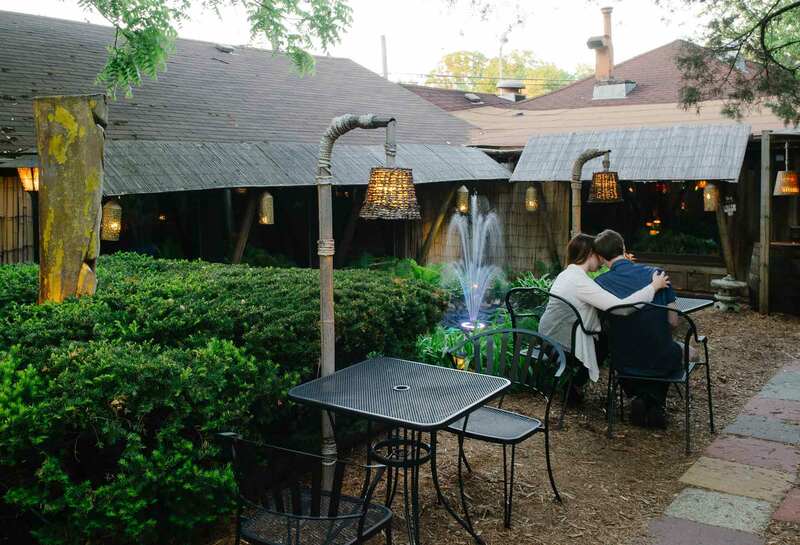 Oppedisano’s grandparents, Rose and Stanley Sacharski Jr., didn’t set out to open a tiki bar. They hardly knew anything about the pop cultural movement. To this day, no one in the family has traveled further west than California. (“I’ve never been to Hawaii. I don’t like vacations,” Rose told the Chicago Reader in 2001.) 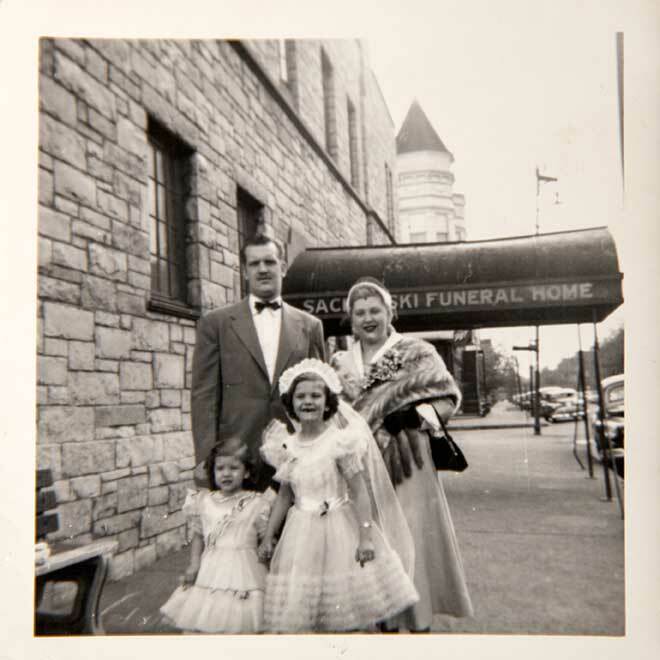 Stanley ran a funeral home for more than 20 years before he and his wife decided to open a bar. But in 1963, the Sacharskis bought a tavern in Chicago called the Lucky Start and happened to cover the walls with bamboo fencing from Sears. “Patrons were asking, ‘Are you going tiki?’ They said, ‘What the heck?’ And they went with it,” Oppedisano says. And in 1966, when the Sacharskis moved to River Grove and opened a new bar, “they just decided to go full force with it.” The name, which translates loosely to “House of Pineapple” in Hawaiian, was spotted by the Sacharskis’ children in a Dennis the Menace comic where the characters visit Hawaii. Patrons were asking, ‘Are you going tiki?’ They said, ‘What the heck?’ And they went with it. The term “tiki” refers to a stone or wooden carving of a human form, used in certain Oceanic cultures to mark sites of sacred importance. 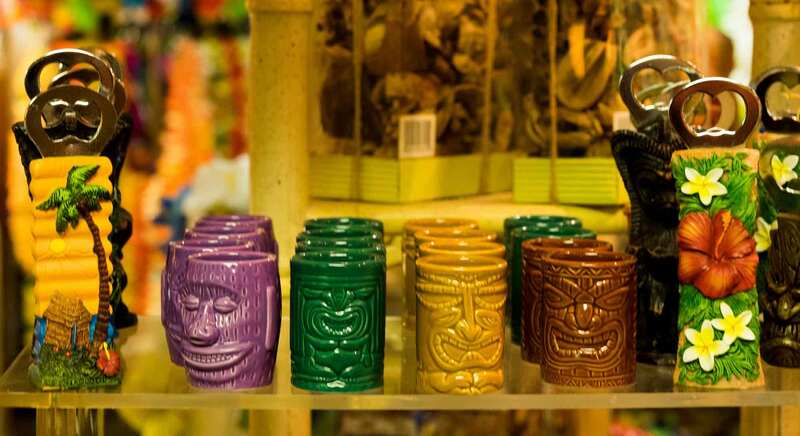 Tiki culture, as it developed in the U.S. during the mid-twentieth century, arose from a naive fascination with anything deemed exotic, whether it hailed from Polynesia, Hawaii, the Far East or American suburbia’s misinformed imagination. The fad dates back to 1934, when a Southern California transplant named Ernest Beaumont-Gantt opened a Polynesian-themed bar in Hollywood called Don the Beachcomber. That same year in Oakland, a restaurateur named Victor Bergeron opened a luncheonette that would later become Trader Vic’s. These two restaurants and their colorful founders became tiki’s standard bearers. Norwegian explorer Thor Heyerdahl’s Kon-Tiki expedition in 1947 further fueled American interest in tiki, as did the experience of American soldiers who served in the Pacific during World War II. Among those servicemen was James Michener, whose novel “Tales of the South Pacific” won the Pulitzer Prize in 1948 and inspired the musical and film. 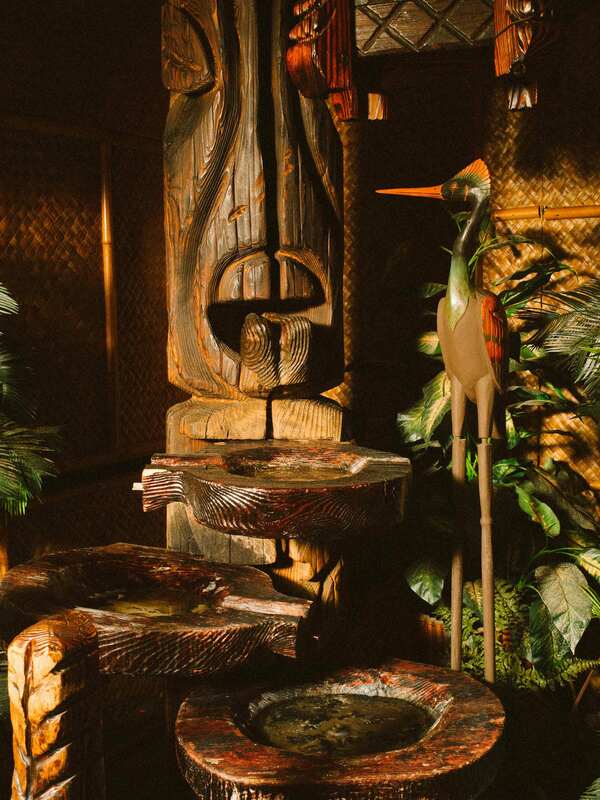 Middle-class Americans who bought houses during the flush post-war period built tiki-themed rec rooms in their basements. Elvis Presley and Hugh Hefner furnished their mansions with Witco pieces. Meanwhile, Don the Beachcomber and Trader Vic’s expanded into mini-empires, bringing their cocktails, tropical cuisine and cheerfully appropriated Polynesian motifs to locations nationwide and even overseas. Rose and Stanley threw themselves into the tiki aesthetic. They made a natural team, with Rose brainstorming decor ideas that Stanley would build during the day before his evening bartending shift. The couple lived in an apartment in the rear of the building with their three children: Stanley Sacharski III, called Sonny; Stanlene, called Cookie; and Rosemarie, called Dolly. Soon the Sacharskis were buying and selling so much Witco and other decorative tiki objects that they got a retail license and opened a gift shop on the premises. The bar’s gift shop sells items like bottle openers and shot glasses. “Hala Kahiki has survived because it is in a suburban area, on a piece of land owned by the family,” James Teitelbaum, the Chicago-based author of the travel guide “Tiki Road Trip,” wrote in an email. 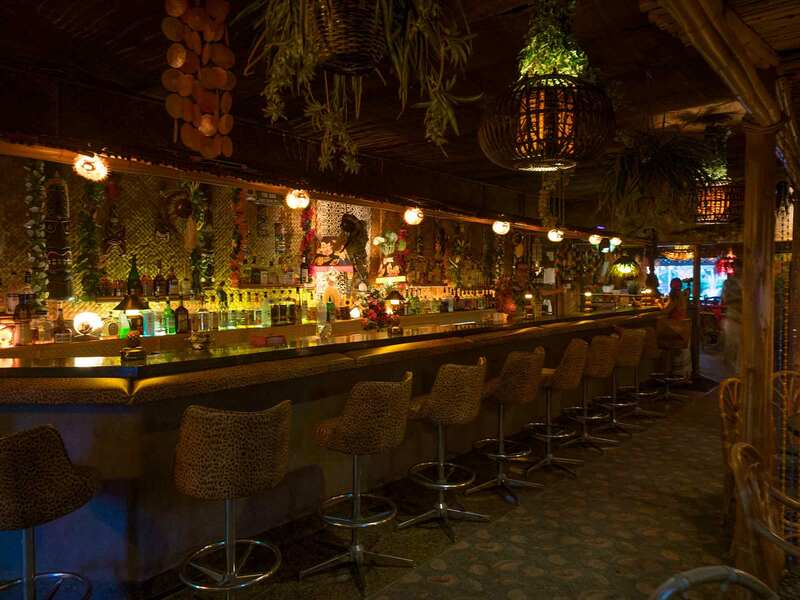 A longtime tiki enthusiast, he discovered the Hala Kahiki on a late-night drive in 1996 and considers the bar’s atmosphere, if not its drinks, to be a gold standard. The Hala Kahiki’s trapped-in-time quality is part of its appeal. But not everything about the retro atmosphere still works for today’s customers. While the Hala Kahiki’s lack of TVs means patrons can chat at normal volumes, it also results in empty tables during big games — especially if a Chicago team is in the playoffs. And the only food options at the Hala Kahiki are pretzels, taro and sweet potato chips, and pre-made mango and pineapple salsa. Stanley and Rose converted the building’s kitchen into additional seating early in the bar’s history. Several times a week, customers wander in and sit down, only to leave abruptly when they open their menus and realize they can’t get a meal. A couple enjoys a quiet moment on the back patio. As a child, Oppedisano would accompany his mother, Cookie, to the Hala Kahiki on Thursday evenings. She would pre-mix the ingredients for popular cocktails like the Zombie and the Mai Tai. Then she would make two chocolate drinks — one alcoholic, one non — and mother and son would enjoy them in the back room. He also pitched in at the South Seas Gift Shop (spelled “South Sea’s” on the exterior signage), which now occupies the spot that used to be the Sacharskis’ apartment. 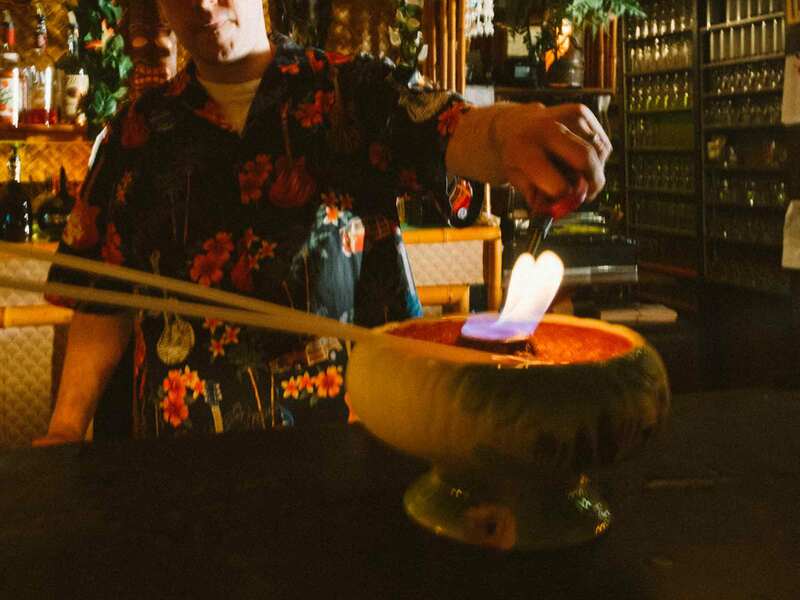 Oppedisano lights up a Volcano, a drink for two served in a special bowl with long straws. Oppedisano worked at the Hala Kahiki throughout his adolescence, helping his grandparents with payroll, repairs and other jobs. But he wouldn’t run the family business full-time until later. After one semester of college and a short stint at Sears, Oppedisano joined Starbucks and met his wife, a fellow store manager who ran the cafe down the street from his. For years after that, he worked in advertising in Florida and Wisconsin, only occasionally helping out at the bar. When Stanley died in 1998, Cookie and Sonny took over the Hala Kahiki. Rose passed away in 2005 and Cookie died in 2011. Oppedisano inherited his mother’s half of the Hala Kahiki. He was Cookie’s logical successor, but he wasn’t sure if he wanted the job. (Sonny, who died in 2007, had left his half of the bar to his wife, Maggie. She died in April 2014, passing her share of the business to the couple’s two children.) The business was making money and had many loyal customers, but it was haphazardly managed — there wasn’t even a cleaning schedule in place — and Oppedisano suspected employee theft. He had also seen his mother burn out. Is there a huge opportunity here with this business and what we can do and how I can grow? Yes, definitely. But Oppedisano did have management experience. And he saw promise in the family business. One of the bar’s showpieces is this large Witco fountain. Last year was the busiest in the history of the bar, according to Oppedisano. But he’s constantly brainstorming ways to improve the business. (He hears complaints about the non-wheelchair accessible bathrooms, the aging white plastic furniture on the outdoor patio and the gravel parking lot.) In the short term, he is planning to install video poker machines. He hesitated at first, worried the machines might upset the tiki vibe, but he’s always run the business with a pragmatic streak. The jukebox plays contemporary pop and the bar serves beer and wine, aesthetic choices that would displease a tiki purist but have broadened the Hala Kahiki’s appeal. For the video poker, Oppedisano asked customers for feedback and studied public state records to see how much money other bars were making from their gaming terminals. He plans to “sell it like (an) old-school Vegas comes to Hawaii type of thing,” he says, so that the machines will blend into the bar’s aesthetic. Oppedisano’s longer-term ambitions include perhaps putting up a partition to create a sports bar area with TVs, or even opening a new place with a kitchen and non-tiki theme. In the meantime, the Ko Ko Mos and the piña coladas will keep flowing under the watchful gaze of the bar’s tikis. This profile on Hala Kahiki was written by Wailin Wong, with additional editing by Emily Wilder and Sarah Morgan. Art direction, design, and development was by Mig Reyes, with illustrations from Nate Otto, photography by Michael Berger, with audio and video by Shaun Hildner.